The first Be My Eyes Community Meetup took place in Hong Kong. Picture showing some of the participants at the Community Meetup in Hong Kong. 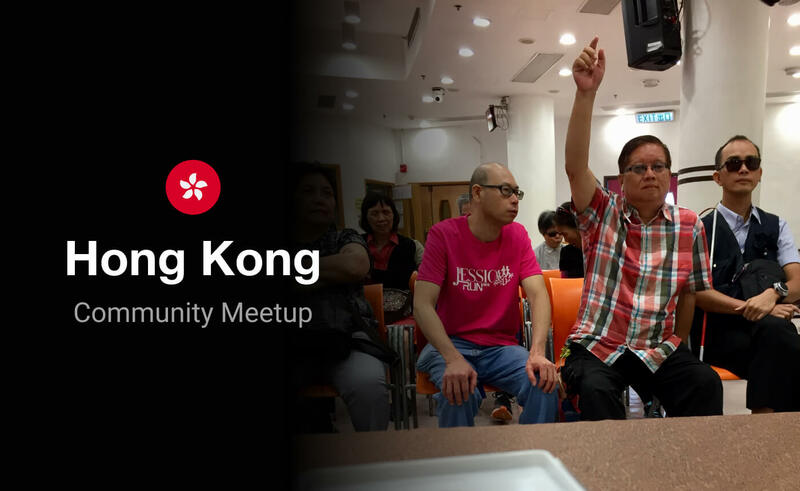 The left side is faded in black and shows the words "Hong Kong Community Meetup". Our very first community meet up took place on May 17th in Hong Kong! It was a great opportunity for our members in Hong Kong to get together, share their experiences with the app, and learn more about the new features. Up to 30 people participated in a casual afternoon meeting. Those new to the app had a chance to take it for a spin, experienced users shared their first-hand stories and tips, and Be My Eyes Designer, Jozef, was there to answer all of the questions. Big thanks to Hong Kong Society for the Blind for providing the venue! We’d also like to extend a thank you to the volunteers who helped us with translations. The app is now completely available in both Chinese Traditional and Simplified.